Working Expedition Compass Pendant. Stunning & waterproof. Working silver compass pendant with a golden pointer. 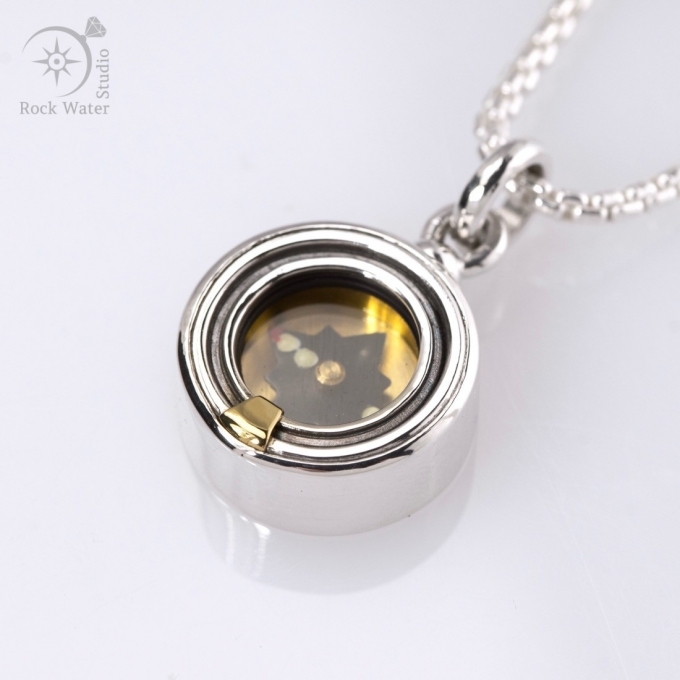 A compass to keep with you, always, this beautiful compass is also waterproof. As a compass necklace gift for your wife who has no sense of direction, or as a Graduation Compass Gift, my creations are not only beautiful, they’re made to last, too. Choosing one of these waterproof compasses means you’ll be trouble-free if the compass gets wet because a waterproof compass means it’s completely OK in water. It’s much more than splash-proof and is safe to wear in the shower, swimming or even snorkelling. This is a compass talisman you never need to take off, it’s a compass you can keep with you everywhere your adventures take you! This simple silver compass design has a touch of gold. But this compass pendant is so much more than just beautiful. With a top quality working compass inside, a Francis Barker survival compass, uniquely customised to make it waterproof this is a practical compass gift you never have to take off or be without. Wearable silver compass treasure and talisman, to keep you safe and make sure you can always check your direction. A versatile compass pendant suitable for a man or woman, this could be a Christening Compass Gift, a Silver Wedding Anniversary gift for your wife, or a meaningful Christmas gift for your girlfriend. Maybe a compass pendant to bring someone back safely, a Christmas Gift for a practical man, or a treat for yourself as you set out on your own adventure. A compass makes the perfect travel themed gift for someone special, too. Unique, handmade compass necklace that’s practical, beautiful and reliable. What is the size of this compass pendant? Here are the dimensions for the Expedition II Compass Pendant. It has a diameter of 19mm and is 9mm deep (from front to back). It weighs around 12g. Silver compass with 18k gold pointer.